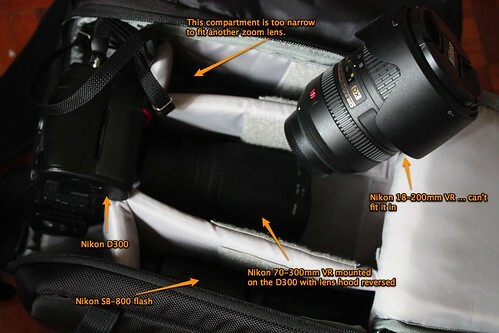 This is a summary of discussions on the best camera bags to accommodate the Nikon D300, lenses and accessories. 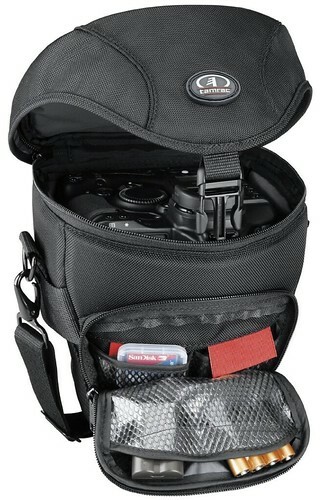 The Tamrac TA5627B 5627 Pro Digital Zoom 7 Holster can accommodate a Nikon D200 with a Nikon 18-200mm VR lens, or a D300 with a Nikon 16-85mm lens, and was recommended by TestEng. Nikon 70-300mm VR on the body in the center position. A Nikon 105mm f/2.8G VR on the right side. 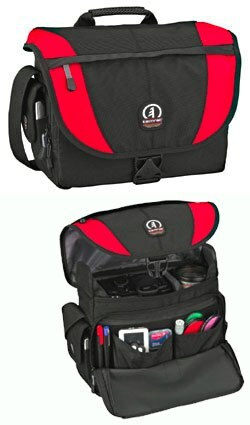 The Tamrac 5534 looks like it can carry much more equipment than my Lowepro Fastpack 250 can. When I attach the Nikon 70-300mm VR to the D300 and put it in the Lowepro, I can pretty much forget about carrying any other normal zoom lenses, for instance my Nikon 18-200mm VR, let alone the relatively gigantic Nikon 105mm VR macro lens. All Nikon articles – Main page. July 3rd, 2008 at 2:27 am The Lowepro Slingshot 200 is convenient and easy to use. It’s a perfect fit for my Nikon D300 with my 18-200 VR lens attached. There’s also room for my 17-55mm f/2.8 lens, SB-800 Speedlight, two other lens and accessories. When I buy a longer lens, I’ll upgrade to the Slingshot 300. July 9th, 2008 at 9:01 am The BEST for my purposes is the Lowepro Roller 1. Everythings fits comfortably safe. Size equals that of approved airline carry-on. Very solid construction in all areas. Price is right too. Check it out. If I’m not using the Lowepro Roller 1, you’ll find me with one of my Billingham bags.